September sharpens one’s priorities, in that every weekend offers so much to do that only the most attractive or important options make the cut. We are all entitled to our illusions about ourselves, but the truth will out on Saturday and Sunday! For example, this is really the only time of year I get excited about cardinals, at least if they are from Arizona. That’s right… NFL football is back, baby! The good news for those of us who like both birds and sports is that a team with an avian avatar looks likely to make it to the Super Bowl again. 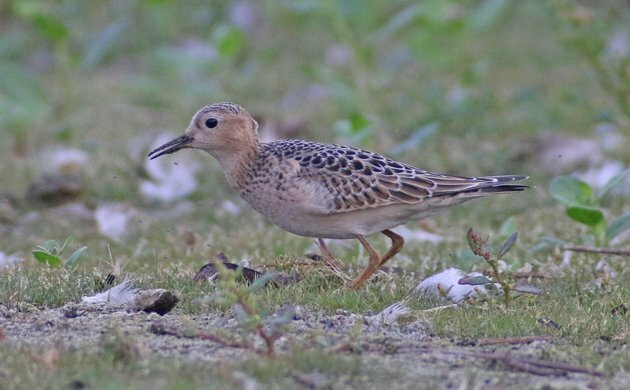 Corey’s Best Bird of the Weekend is one he considered long overdue, his first Buff-breasted Sandpiper in Queens ever! He was very pleased to see two of these marvelous shorebirds on the East Pond of Jamaica Bay Wildlife Refuge and nearly as pleased to check them off his Queens list. Number 305! Birding just didn’t happen this weekend. But my Best Wildlife of the Weekend was an Eastern Gray Squirrel carrying in its jaws a crabapple that must have weighed almost as much as the squirrel itself!